A couple of weeks ago, I became intrigued with the idea of doing sheet pan dinners in the air fryer. A sheet pan dinner is basically a one-pot meal that you cook in a pan in your oven on a baking sheet or sheet pan. 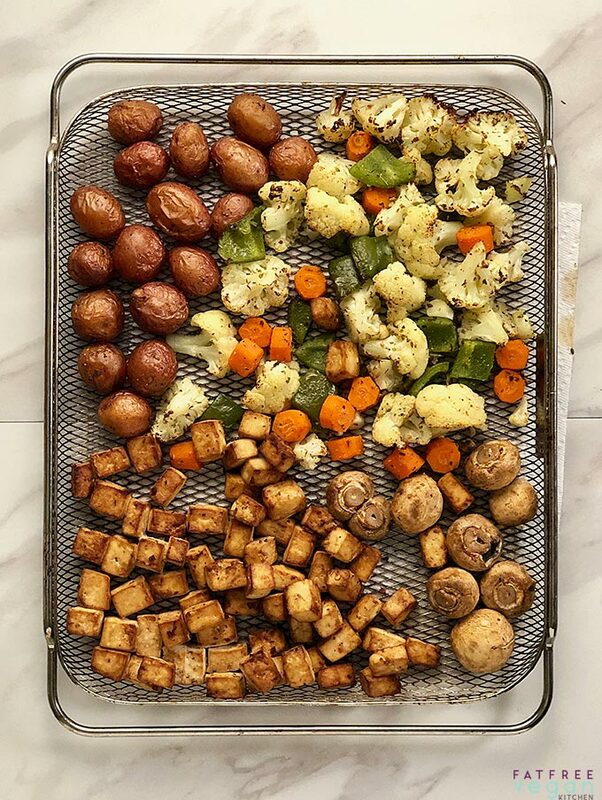 Sheet pan dinners have been popular on food blogs lately, but I don’t think anyone else has been crazy enough to attempt to cook one in an air fryer–until now. My air fryer is not the typical stand-alone, single use appliance. It’s a Breville Smart Oven Air, and compared to the typical air fryer, it is HUGE. Compared to the typical toaster oven, it is even HUGER. A normal-sized baking sheet or lasagna dish can easily fit inside it. It has a strong fan to air fry foods and a metal mesh basket that holds a ton. Between the strong fan and the mesh basket, food can cook on all sides without needing to be turned. The Breville isn’t as fast as a regular air-fryer, but it’s still faster than baking in the oven. It makes it easy to cook a whole dinner at once; if you have a regular air fryer, you will probably need to cook some of the ingredients separately. It was a huge success! I started by marinating the tofu and mushrooms briefly in soy sauce and Trader Joe’s Umami Seasoning (which gives a savory yet spicy kick.) I pre-steamed tiny potatoes for a few minutes to get them partially cooked, and seasoned them and the cauliflower and carrots with salt, pepper, garlic powder, and herbs. Then I set the Breville to Air Fry and the temperature to 450F. I set a generous 25 minutes on the timer and put the air frying basket in the oven to preheat. Once it was hot, I added the tofu in a single layer. I let it cook for 10 minutes and added the potatoes to another section of the basket. After 2 more minutes went by, I added the cauliflower and carrots. Four minutes later I added the mushrooms. They were done–as was everything else–in about 4 more minutes. All together it took about 20 minutes to cook, and everything was done at the same time. I first posted the photo above on Instagram and in my FatFree Vegan Air Fryers group, and I received a lot of encouragement to keep experimenting. My next attempt was so good that I just had to share the exact recipe, along with some of the things I’ve learned about using the Breville Air to make sheet pan dinners. 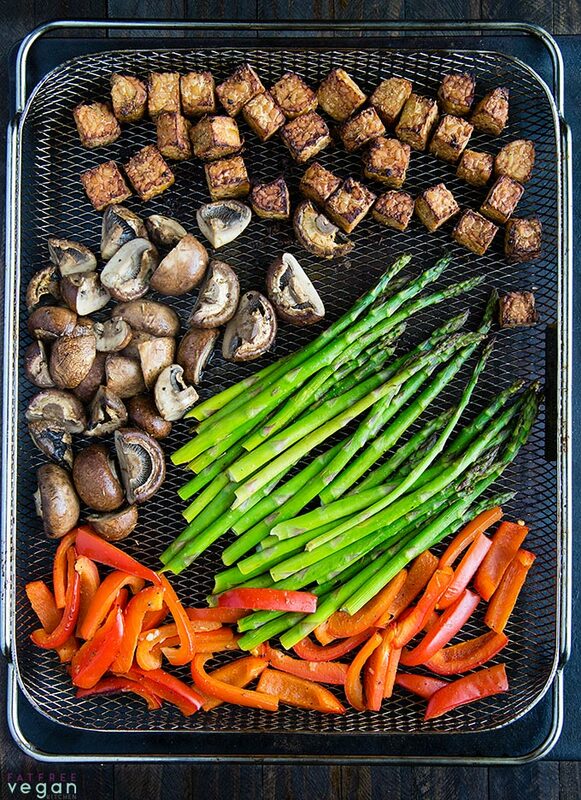 Sheet pan dinners generally contain a protein and complementary vegetables. 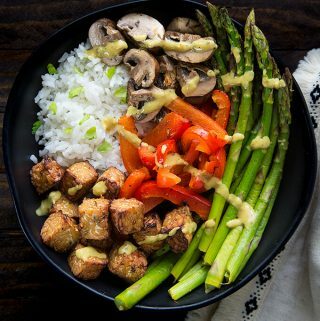 In a vegan sheet pan dinner, the protein is often tofu or tempeh, but even pre-cooked seitan, packaged meat substitutes, or cooked beans can be used. One of the tricks for making a successful sheet pan dinner in the air fryer–or in the oven–is adding the ingredients to to the pan at the right time. If you want your vegetables to be cooked but still retain a crisp texture, you have to be careful not to overcook them. Cubed tofu takes about 20-25 minutes in the Breville, and cubed tempeh takes about 16 minutes; root vegetables like potatoes can cook in a similar time if they’re cut small enough, but most other vegetables will be overdone if you put them in at the same time as the tofu, tempeh, or potatoes. So you need to stagger the timing at which you add them to the air fryer. Figuring out the timing is tricky: Almost all lists of air fryer cooking times were created for single-use air fryers, like the Phillips and Go Wise. The Breville holds a lot more, but it cooks more slowly, even when turned up to a much higher temperature. And, if you fill it up with a whole dinner, you may need to add a couple of more minutes to the cooking time. It’s very much a “play it by ear” enterprise, and the more you experience you have cooking in the Breville, the better you will be able to estimate cooking times. Be prepared to take some food out of the air fryer (or oven) as it gets done; it’s better to have to warm it up than to have it burn. Cut your vegetables a uniform size so that all of them cook at the same time. Try to avoid size mismatches like cooking very thin asparagus with extra-thick ones. If there’s a chance something might stick (such as tofu) don’t stir it. I know that sounds the opposite of what you might think, but cook it long enough so that a crust begins to form; then you can stir or shake it loose, if necessary. I rarely stir anything in the Breville. Don’t use sauce in the Breville! The oven has the advantage for cooking saucy sheet pan dinners because the Breville’s air fryer basket is not meant for drippy foods. Even if you cover the bottom of your Breville to keep drips off, the bottom heating element is between the air fryer basket and the bottom, and getting liquid on it could cause all sorts of problems. Using a pan under the air fryer basket reduces the effectiveness of the convection fan; you might as well roast your food on the pan. I lightly marinate food and then lift it completely out of the sauce and let it drain a little before air frying. 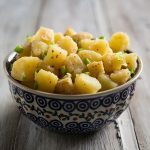 While there are no resources for making sheet pan dinners in the air fryer, there are some resources that can help you put together your own dinners. This article in the New York Times contains some good general guidelines for making sheet pan dinners in the oven. This follow-up has some great ideas for vegetarian sheet pan dinners, which you may need to veganize. Two good books about vegan air frying are Kathy Hester’s Vegan Cooking in Your Air Fryer and JL Fields’ The Vegan Air Fryer. For my second air fryer sheet pan dinner, I decided to experiment with tempeh, a soy product my husband absolutely loves. I knew I wanted it to pair it with asparagus and thought that a light lemon flavor would complement both foods. Tempeh benefits from a good marinating, so I planned ahead and let it marinate several hours before cooking. If you have the time, I really recommend letting it marinate as long as a day; stir it every now and then to make sure all the tempeh cubes get flavored. Air frying gives tempeh a great texture–dense and slightly crisp on the edges. I wanted the asparagus to retain its crispness and not get dried out, so I watched it more carefully than the other ingredients; a few of the thinner spears were done before the others, so I whisked them out of the air fryer a little early. You may find that you need to play with the timing to get the vegetables done to your liking. My best advice is to stand by and watch them so that nothing burns. When you’re air frying without oil, food can dry out more easily, but careful attention can make sure that doesn’t happen. 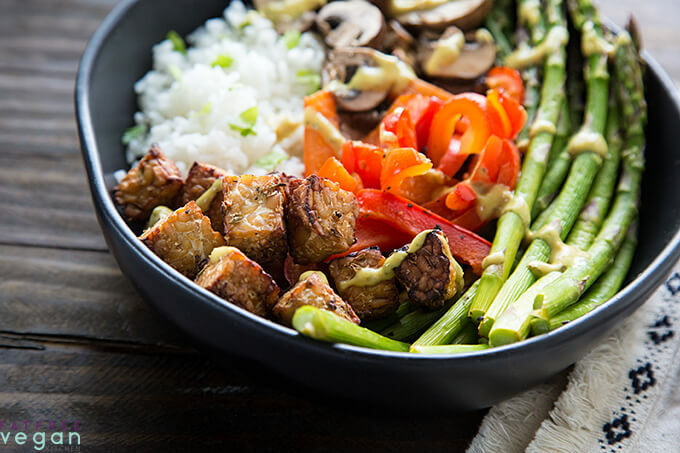 Slightly crisp cubes of lemony tempeh are complemented by fresh green spears of asparagus, sweet red bell pepper, and plump mushrooms. 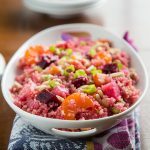 Serve it as a bowl on top of rice, and drizzle with your choice of dressing. 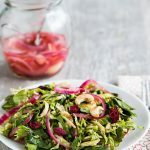 A lemony tahini dressing is perfect! In a large bowl, whisk the marinade ingredients together until well-blended. Add the cubed tempeh and gently stir to coat. Cover and allow to marinate in the refrigerator for at least 2 hours, up to overnight, stirring occasionally. Drain the marinade from the tempeh into a rectangular baking dish. (Do not throw it out.) Add the asparagus to the marinade and toss to coat. Lift the asparagus out of the marinade and place it on a plate. Repeat with the mushrooms and bell pepper. If you’re running low on marinade, freshen it up with a splash of lemon juice. Follow the Preparation Instructions above. Set the Breville to the Air Fryer setting, place the basket on the appropriate level, and set the temperature to 450F and time to 16 minutes. 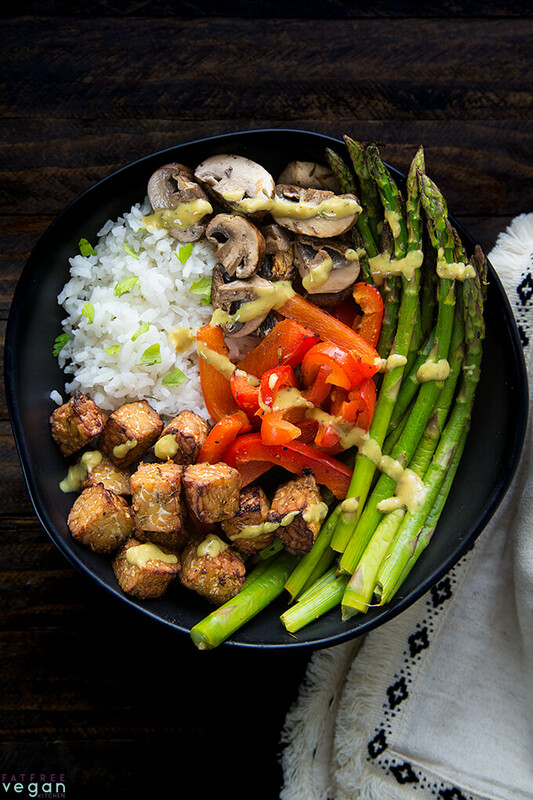 Remove the tempeh and vegetables from the air fryer and serve over rice, drizzled with tahini sauce or your choice of dressing. Follow the Preparation Instructions above. Preheat oven to 350F. Line a baking sheet with parchment paper. Place the tempeh on one side of the pan in a single layer. When the oven is hot, put the pan in and set a timer for 8 minutes. After 8 minutes, turn the tempeh with a spatula and add the vegetables to the other side of the baking sheet, in a single layer. Bake for 8-10 more minutes, until the tempeh is beginning to crisp along the edges and the vegetables are tender but not over-cooked. If any one food needs more time, remove the others so they don't get over-cooked. Serve over rice with your choice of dressing. If you want to make this in a regular air fryer, you will probably need to cook each ingredient separately. I suggest setting the temperature to 375 and cooking for a little less time than I give. 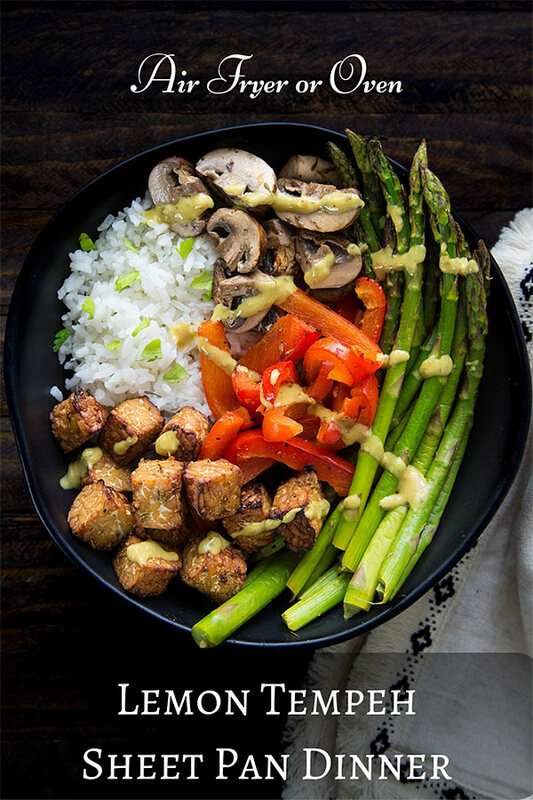 I drizzled each bowl with about a tablespoon of my Tahini-Chickpea Dressing, which added about 13 calories per serving, but you can use any salad dressing or sauce you like. Other good options would be Spicy Chipotle Dressing or Lite Goddess Dressing. Nutritional info in the box below is for 2 large servings and does not include dressing. Each large serving is 8 points on Weight Watchers Freestyle, including 3/4 cup of white rice. 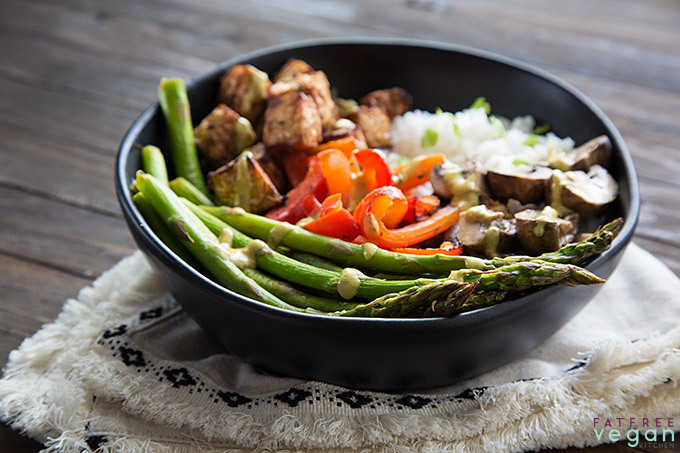 Without the rice, each serving contains 309 calories, 7g fat, 36g carbohydrates, 17g fiber, and 32g protein. Without rice, a serving is 4 points. I hope you’ll try one of my sheet pan dinners–either in the oven or air fryer–and experiment with your own combination of ingredients. Let me know what you discover! This post contains Amazon affiliate links to products that I like. I may receive a small commission on anything you buy through them, but I promise to put it to good use. Since an air fryer is nothing more than a small convection oven, this recipe could be made in a pan in the oven on the convection setting. I was so excited to see a new recipe from you since you never disappoint. This spring meal called out to me so I got right down to work. Used the oven method since I don’t have an air fryer, and it came out great. And the Tahini Chickpea dressing? Yummmy. Both my husband and I give this 5 stars. Thanks, Susan. I’m so glad you liked it! Thanks for taking the time to leave a comment. Looks so good! Are you saying that if you use this oven with that basket sometimes things drip and it is not easily cleaned? I am considering buying one to have instead of a traditional air fryer but want something that is easily cleanable. Thanks for any advice. Unfortunately, yes. The Breville instructions warn not to use it with foods that drip (which I would think would make it impossible to air fry meat or batter-dipped foods in it.) In my experience, the regular air fryers are much easier to clean, at least the Phillips I had. The basket is meant to be taken out and soaked, if necessary. You can remove the tray at the bottom of the Breville for cleaning, but that doesn’t solve the problem of drips getting on the heating element. It’s something to think about before buying. Thanks for clarifying – I appreciate your response (and all the time you put into the blog). Hi! 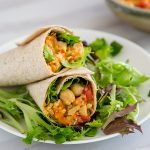 I went to your blog to find a tempeh or tofu recipe and this one was right and center!! I put the tempeh to marinate Monday afternoon, but haven’t gotten to it yet. Do you know if it will be okay today? How would i know? Normally I don’t marinate that long, but I think it will be fine. Maybe just very lemony!